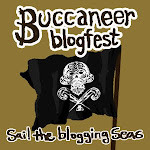 ﻿I caught up to this blogfest before the first day was out -- grr, otherwise I might've had to send someone over the plank! *Waves hook around* So now our brigade of lads and lasses are sailing together o'er the seven seas, and...what, too dramatic? Oh, fine. We're led by Captain Sharon Bayliss and Captain Court Young! Well, it's July 9th, which is INTRODUCTION DAY! Don't comment on the cat on my shoulder. I don't have a parrot. Lemme give ye contact info first. This is my blog, of course. And for some privacy reasons I'll withhold my Facebook account. If you wish for my e-mail for any reason please contact me on Twitter and ask for it. If you really want my Facebook account, you can ask for that too. Arrrgh. Info-time! I'm a 16-year-old writer of YA, as of yet, not published. I have a ton of WIPs, but my top priority is one about elemental-users. Currently in the editing stage. You'll learn more next week! I started writing when I was in 3rd grade. The book I wrote (31 pages long) was about psychic kittens. I planned to make it a big series, but I lost the sequel to the first and gave up after that. As for genres, I stick to Urban Fantasy. I'm exploring Fantasy and Paranormal. I have a bunch of interests that don't pertain to writing...I think. As so many of you will see by exploring my blog a little, I love weird music. Think the background music of Final Fantasy. That's what I listen to. There's another interest: Final Fantasy. I loved Final Fantasy XIII. I also enjoy Kingdom Hearts. Er... I like almost any kind of book, as long as it has SOME supernatural element in there somewhere. And as long as the characters have a good voice and are likeable. I really need a new bookshelf. I live in The-Middle-of-Nowhere, IL; USA. I'm a senior in high school (or, at least I am in August). I'm currently jobless, but you know, maybe I'll be a published author before long. Maybe. Wouldn't it be awesome? Hm, what about some other hobbies... I like to drive for no reason (my parents get so angry about the gas-guzzling), I like to run, and I like cats. I like dogs too but I have cats, SO. I don't really hang out with people in RL. Sad, I know. But that's what school is for, for me. :P But I DO have friends in RL...I promise. Very nice to meet you! I'm 17 and an aspiring author as well. I write YA fantasy and sci fi. And who needs friends in RL when you have the internet? @DL: YA Paranormal is turning out to be so much fun!! You are lucky to be young and able to write all day. I can't wait to hear more about your WIPs. My son is also going to be a senior this year. Sadly, he doesn't write, except songs after a girl dumps him. He's a photographer, though. I grew up in Indiana, so I can relate to being in the middle of nowhere, except now I live on the West Coast. Follow your dreams! I love being able to write non-stop. Having to look for a job sort of hampers that, but not enough to make too much difference. (: I hope to live on the west coast someday as well! Kendra, I admire that you are already working toward your goals. In high school, I wanted to be a hippy. Yeah... that didn't work out so well! My fingers are crossed that you get that first yes soon! Thank you, Ayden! LOL, you still ended up a writer in the end. It's all good! Nice to meet you, Kendra! Oddly enough, I wrote a story about kittens having out of body experiences when I was in 4th grade. I'm completely intrigued by your psychic kittens story and encourage a revival! Ah, the bottom of really wet nowhere USA is Louisiana by the way! This blogfest should be fun! Sounds like a fun blog hop. I'm heading over to check it out. @Roland: Haha! Thank you. (: Louisiana... Never been there! I wouldn't know! Lol, it's nice to meet you too :D Looking forward to the bloghop. Hey Kendra! It is so nice to meet you! Stick with your passion. Don't let anyone tell you to pick a "real major" when you go to college. Sadly, one of my biggest regrets was when college started, I stopped writing. I use to love driving around for no reason also when I was your age. It made me feel free and in control. Enjoy high school while you can, one day you may miss it! :) Looking forward to learning more about your writing projects and you! Glad you joined our blogfest! ARGG!! Welcome to the blogfest! Congrats on having so many WIPs going; make sure you finish them, though :) You never know where those ideas might take you.